Hydraulic accumulator sets built as parallel systems of several pumps are designed for pumping water, raising water pressure in supply networks, and compensation of hydraulic losses resulting from the parameters of supplied pipelines. The pumping sets are designed to supply potable water and/or treated utility water without solid sediments at a temperature below 40oC (ZHA.0 - ZHB.3), 90oC, or(ZHA.4 - ZHA.7, ZHF). Maximum operating pressure of the set: 10 bar. h type of control. This part of the index is covered in the section about the set control system types. i i i factory designation of the control system. It is issued at the stage of quotation or order confirmation once the function and operating method of the set have been defined. OPF pumps are multi-stage devices in vertical arrangement n which all parts in contact with the pumped liquid are made of stainless steel. The hydraulic accumulator sets are systems of several pumps that usually have the same size and which are connected in parallel to the supply and delivery manifolds by non-return and cut-off fittings. The set pumps are installed on a support structure made of steel sections. The support structure features vibration dampers that allow setting the set directly on floors. The ZH hydraulic accumulator sets are equipped only with pumping sets manufactured by Hydro-Vacuum S.A. It is a welded structure made of steel sections set on vibration dampers with height adjustment in the range of 20 mm and a levelling system. The manifolds combine the individual pumps in the set on the supply/suction and delivery ends. They are made of welded pipes and standard flange connections. One side of each manifold is ended by suitable metal and rubber flange caps. The manifolds have connector pipes for measurement equipment and protective devices (pressure transducers, pressure gauges, pressure controls, LCA pressure switches, etc.). The manifold layout and diameter can be customised on request. Every unit in the ZH set is equipped with cut-off fitting on the supply/suction and delivery ends to isolate individual pumps without interrupting the operation of the whole set. The delivery side of each pump features a non-return valve. Due to the necessary adaptation to various functional and installation conditions, the hydraulic accumulator sets are available in a wide range of design versions specified by a four-character code. The vertical frames are designed for free orientation of the control cabinet. The control cabinet vertical frame has an individual secondary frame. One end rests on the pump support structure and the other on an extra set of vibration dampers. There are designations for four mounting versions of the cabinet in the design version index: e1e2e3e4. 1 The cabinet is installed in parallel to the set manifolds. 2 The cabinet is installed on top of the set (perpendicular to the manifolds). 3 The cabinet is outside of the set structure (without its frames). It is wall mounted at the plant. 9 The installation style is as required by the customer. Example: The set cabinet in a field enclosure with a thermostatic heater for outdoor installation. The manifolds, the support structure, and the pump connectors are offered in two material versions specified by the second position of the four-character code e1e2e3e4. 0 The support structure of the pumps and of the control cabinet, as well as the set manifolds with pump connectors are made of structural carbon steel that is dip zinc coated for anti-corrosion protection. 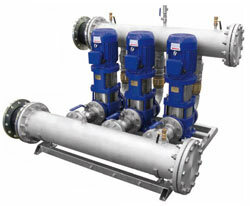 1 The support structure of the pumps and of the control cabinet, as well as the set manifolds with pump connectors are made of acid-resistant steel. The necessary adaptation to various functional conditions (e.g. inclusion of additional flush pumps or connector types) requires designation of the manifold versions in the design version code. It is the third position of the four-character code e1e2e3e4. 0 Standard manifold version. Flanged connectors. 3 Manifolds for sets with the test bypass. 4 Manifolds for sets with flush pumps. 5 Manifolds for sets with fire pumps. 6 Manifolds for sets for a variety of type series and type sizes of pumps. 9 The custom version required by the customer at the quotation or design stage. The hydraulic accumulator sets are available in different delivery completion ranges. It is designated by the fourth position of the four-character code e1e2e3e4. 1 Basic delivery completion (pumps + frame + manifolds + fittings). 4 Completion range "1" + control + pressure transducers. 5 Completion range "4" + flow meter and suitable application of the controller software. 9 Delivery completion range as agreed at the quotation or design stage. It is always possible to customise the solutions to detailed requirements concerning every aspect of the offered set. There are several control types for the pumping sets offered, due to the wide variety of applications. 1 Adjustment using a rolling (switchable) frequency converter. The control unit is a microprocessor-based controller. 2 Cascade control (on/off). The control unit is a microprocessor-based controller. 3 Control by a frequency converter linked to a single pump with all other pumps switched on in a cascade. The control unit is a microprocessor-based controller. 4 Control and adjustment with a frequency converter with an onboard controller featuring an application for control over the pumping sets. The control unit is a microprocessor-based onboard controller of the frequency converter. 9 Design version according to individual and precise customer requirements. Pump speed control depending on the delivery manifold pressure (in an FC system, h = 1). The control system maintains a constant pressure or its specified values in a defined interval by switching various pumps on and off, and adjusting the RPM of the pump that is currently connected to the frequency converter. Switching the pumping unit on and off depending on the delivery manifold pressure (in a cascade system, h = 2). The control system maintains a constant pressure or its specified values in a defined interval by switching various pumps on and off. Starting of successive pumping units in the set (by a frequency converter or directly from the mains, or optionally by a thyristor soft starter). Pump running time balancing: equalisation of the usage rate and test running of pumps in a set that provides fire water supply (all identical pumps of the set). In this function the first pump to be started is the pump with the shortest running time or with the longest standstill. It also prevents starting of more than one pump at the same time. It is possible to set a time delay after which the next pump in the set will start. Stopping and switching the set to standby in periods of zero demand. Stopping of pumps at programmed permissible pressure setpoints. Adjustment of the system's performance of the supplied pipeline characteristics by discrete adjustment of pressure setting values in relation to the number of running pumps or preset measured flow rate (optional connection to a flow meter). Readouts of all measured operating parameters. Adjustment of parameter settings in relation to time interval settings (option). The control system automatically switches to cascade operation when the frequency converter fails. The control system enables switching to manual mode when the controller fails. Collection of data about the values measured in the last seven days. Memory of all operating state changes of the set with precise event times (storage capacity: 1000 events). Collection of data about individual pump running times. Export/transmission of data packages over a serial link in an agreed format to external devices (radio modems, phone modems, GSM modems, PCs). 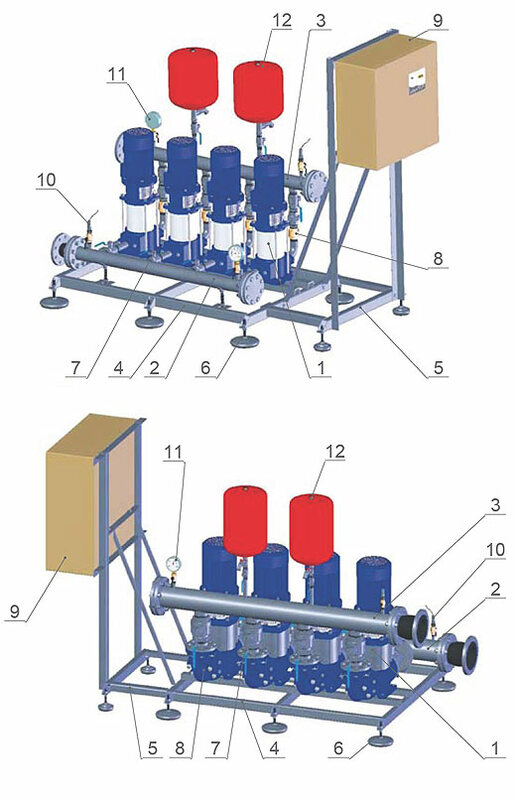 A hydraulic accumulator set with four OPA.5 vertical pumps, a control cabinet installed on the set top; the manifolds, support structures and pump connectors are made of acid-resistant steel; standard manifolds (flanged) adapted for four pumps. The set is delivered with the control system. Adjustment using a rolling frequency converter. Type UZS 8.07 control system with a microprocessor controller. Specify any special requirements for optional functions of the set control system at the hydraulic accumulator set selection stage. 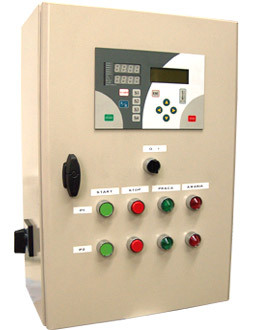 The control system is installed in a cabinet with an IP54 enclosure. The cabinet size depends on the hydraulic accumulator set size. The cabinet sizes are listed in the set dimensioning tables. The cabinet structure is metal with powder coating. The cabinet has an independent support structure (vertical frame) that accomodates any installation orientation. One end of the structure rests on vibration dampers and the other is fixed to the support structure of the pumps. Operating status and failure alarm indicators. The side panel of the control cabinet features the main switch. The set pumps are protected as standard from dry running by conductive measurement probes installed in the main bodies of pumps (ZHA). In addition, a set that is operated with an open reservoir can feature float switches or a system of conductive measurement probes, or work with a hydrostatic probe that controls the reservoir filling. In this version the set has no pressure transducer on the supply manifold. A set operated on a water supply system has the pump dry run protection with the aforementioned conductive measurement probes and a pressure transducer on the suction/supply manifold. The available optional protection includes an LCA pressure switch installed on the suction/supply manifold of the set. The room area should enable installing the hydraulic accumulator set with clearances that enable free access to individual components. The ambient temperature at the installation site should be between +5oC and + 40oC. The room should feature a ventilation system with an air exchange rate of 1/hour or higher. Due to the foundation of the set on vibration dampers with levelling, no extra foundation works are necessary for the installation. The room floor should have a slope towards floor drains for effective water discharge from the installation site. The running hydraulic accumulator set must be protected from flooding with water. If the set is fed by an open storage reservoir, the hydraulic accumulator set should be located to ensure a minimum static flow of 1.0 m at the set connection point. Otherwise contact the manufacturer to select and install a suitable flooding adapter. Each system can have its design and control features customised to exact specifications.